The Kerry Cow is black with perhaps a little white on the udder. She is of dairy type with fine bone, well ribbed and a fine skin. She has a fine pair of white horns tipped with black, although most herds are dehorned now. She has character, is alert and light on her feet. Cows weigh 350 to 450 kg ( 780 to 10001bs ) depending on the type of land on which they are kept. Occasional red calves are born but these are not eligible for entry in the Herd Book. Kerry Cows are very healthy and enjoy a long and useful life, still strong and calving regularly at 14 and 15 years of age. They are extremely hardy and will out winter quite happily, as their bodies seem to have been designed to throw off the rain, and they can grow a good coat of hair which keeps the cold out. Their agility enables them to travel safely over rough ground and they do little damage to the pastures. They are very adaptable, and they do not mind whether they are kept on the side of a mountain - where they will thrive under very poor conditions, or down on the lowland, for they adapt to the conditions and type of feeding available, however, the better the pasture the better the yield. Average milk yield is between 2950 and 3650 kg ( 6500 and 80001bs ) at 4% butterfat, but there are quite a number of cows capable of yielding 4535 kg ( 10,0001bs ) at 4% butterfat and over. Unfortunately not many cows are milk recorded now. The globules of butter fat in Kerry milk are much smaller than in any other breed, thus the food value of the milk is enhanced. It has also been definitely established by doctors and scientists that Kerry milk is one of the nearest approaches in nature to the most perfectly balanced food that we have in any bovine milks. Owing to the small fat globules, Kerry milk is ideal for feeding to babies and invalids who find fat hard to digest. This definitely emphasises the breed as a good proposition for fresh milk, cheese and yogurt production. At least three Kerrys can be kept to two of the other breeds, though some breeders would claim that the ratio is two to one. The cows rarely have trouble calving, for there is far more room in the pelvis than one would think from just looking at the cow. 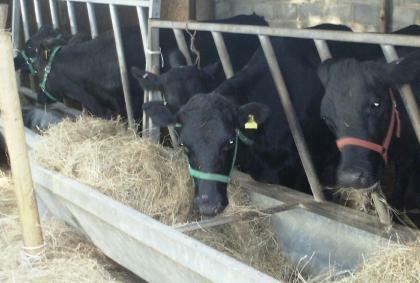 The calves are easily reared and the steer will fatten, though they may take four to six months longer than other breeds, but they make excellent quality beef weighing up to 533 kg (11761 lbs). The cows are equally suited to being one of a big herd or just house cows. They also make good nurse cows. The bull is similar in character to the cow, he is in fact the perfect complement, and is usually as docile and easily managed.